Just about all commercial cleanup projects will require some type of document drying & restoration. Damaged paper quickly deteriorates, so a timely and appropriate document drying process is critical to control these items. 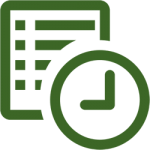 We can quickly evaluate the damage and implement a plan of action to decrease future damage and work towards restore your paper documents. Our certified field technicians utilize special cleaning and drying chambers to help minimize mold growth, paper separation along with other potential damage. Critical items for example x-rays, microfilm or audio/visual media equipment it is often cleaned on-location or inventoried and cleaned in our document restoration facility. 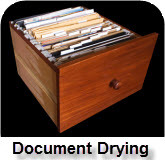 We have the resources to use state-of-the-art de-humidification drying or hydroxyl for documents odor removal. The basic concept in freeze-drying is sublimation, the shift from a solid directly into a gas. Just as evaporation, sublimation takes place when a molecule gains sufficient energy to break free from the molecules around it. Water will sublime from a solid (ice) to a gas (vapor) at the time molecules have enough energy to break free but the conditions aren’t right for a liquid to form. Freeze-Drying is really a non-invasive method with complete retention of form to ensure that your materials will remain in the same condition as at the time they were frozen. In the event of significant water damage we employ a method of freeze drying the documents, to speed up the process of removing water from the paper materials. Each document water damage situation needs to be evaluated differently, as we to employ a variety of methods in preserving and restoring documents. 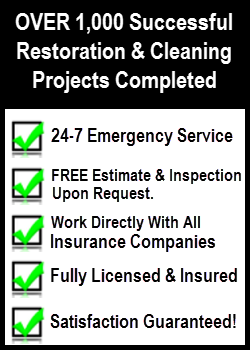 Our disaster cleanup and restoration team has extensive knowledge about document drying and restoration from fire or water damage catastrophes. Whether you have a minor incident or large loss caused by a commercial fire or flood, or manage a medical office and have charts, files and films that need to be restored from a major disaster, our team of professional can handle any size job. We have the capability to mobilize during major disasters and use cutting-edge equipment to ensure your documents are restored to your complete satisfaction. Methodically review damaged materials to create appropriate strategy for cleaning Inventory documents during pack-out clean and dry-out documents in our restoration facility. The very first course of action is to stop the continuing progression of damage. 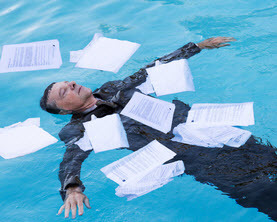 Water in a liquid state coming in contact with your documents hastens the permanent loss of your records. Once the water problems are mitigated, additional contaminants can be dealt with as a secondary situation. Water destabilizes the structural integrity of paper. Freeze drying remains the most effective solution to reduce further damage. Time is of the essence. A quick and organized retrieval system is one of the most critical actions to ensure an acceptable post-recovery item. Once documents come into contact with fire/soot damage, they cease being usable in their present state. Labor intensive techniques exist to eliminate soot damage on the other hand, reproduction of documents could be necessary. Documents involved in a fire/soot loss will have ongoing strong odor and health consequences. Ozone treatment remains to be an effective way for deodorizing documents. Deodorization and fumigation treatments can be used with mitigate contamination.